Being one of the largest messaging app across the continents, WhatsApp receive and send countless number of files of diverse types. They could be formal or informal files and whichever way, every file is attached with some degree of importance. Losing important such files can be quite disturbing and the repercussions can turn terrible in some cases. However, this is a common scenario among scores of users and therefore the thought of data retrieval is inevitable. Fortunately, the contemporary world has made it rather plain sailing by offering a variety of good recovery option. So if you have accidentally deleted your WhatsApp messages and you really need them then you are in the right place. In this article, you shall receive a detailed guide on the best ways to recover deleted WhatsApp messages on your iPhone. WhatsApp chat histories can't be stored on their service. 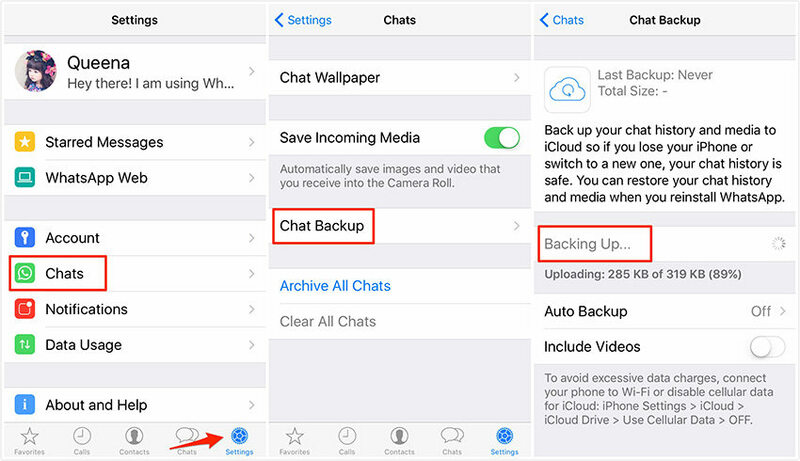 You can use the iCloud backup to back up and restore your chat history. But, with this way, you can't preview and select the item you want. Below is the step-by-step on how to. Before tapping to open WhatsApp application on your iPhone, first ensure that you already backed up WhatsApp messages in iCloud or simply switch on the auto backup. You can check this by simply navigating to WhatsApp > Settings > Chats > Chat Backup. Now, uninstall WhatsApp on your iPhone and reinstall from App Store then verify your phone number. Upon successful confirmation, a welcome notification asking that you restore chat history shall be displayed. Just select the "Restore Chat History" option and the restore process shall immediately begin. When the process completes, the number of messages restored shall be displayed. Tenorshare UltData is the powerful ultimate data recovery tool not only for whatsApp but droves of other data types. This amazing top-notch tool is specially designed for iOS data recovery and its unmatchable reliability explains why a vast majority are making it their indispensable tool. Whether lost through accidental deletion or malware attack, Tenorshare UltData can perfectly recover your lost data. Also, you can seamlessly recover deleted data directly from the iPhone, iCloud backups, and iTunes backups. This tool is compatible with both Mac and Windows operating systems plus it supports more than 20 file types including deleted WhatsApp files. It is certainly among the best tools to recover deleted messages and other data recovery functions. Let's take you through how to recover your messages with this tool. If you don't have UltData, then download and install it on your PC. Now connect your iPhone with the PC using a suitable media, say a USB cable. Tap "Recover from iOS Device" and allow the program detect your iPhone. Upon successful detection, all the data types on your iPhone shall be displayed on the screen. From the list of data types displayed on the screen, identify and select "WhatsApp & Attachments" category. This is option will let you recover the deleted WhatsApp messages. Go to the bottom of the screen and now hit the "Start Scan" button. The program would automatically commence the scanning process. Once the scanning process is successfully completed, the list of deleted items shall be displayed on the interface. Select WhatsApp option on the left panel and then preview these deleted WhatsApp messages on the screen. Just select the target WhatsApp messages and ten hit the "Recover" button located at the bottom of the screen. This guide pertains to those who back up their iPhone to iTunes in regular basis. The process of restoring WhatsApp messages from iTunes backups is seamless as illustrated below. With this way, you can't select the old backup file if you backup your iPhone over 3 times. Step 1. Open iTunes and connect the target iPhone. Step 2. Tap the iPhone icon and choose the option "Restore Backup". Step 3. Now identify and select the backup file containing the target WhatsApp messages. Click Restore to retrieve them into your iPhone. First, you have to confirm the status of iCloud backup to ensure that it has activated on your iPhone. To do so, simply go to Settings > iCloud > Backup. If the iCloud backup has activated, you can proceed to retrieve deleted WhatsApp messages as follows. Step 1. Navigate to Settings > General > Reset > Erase All Content and Settings. Step 2. Stick to the subsequent on-screen instructions until the "Apps & Data" option is visible. Choose "Restore from iCloud Backup" option. Step 3. Choose the respective iCloud backup and wait until the restore process is successfully completed. It is important to note that an internet connection is crucial throughout the entire process. So make sure the Wi-Fi network is not disconnected as the process runs. That's pretty much it! There are a number of ways one can retrieve deleted whatsapp messages. This article has given you the best ways to recover any lost Whatsapp messages you might want to recover for one reason or another. This includes using UltData which stands a cut above those we reviewed and others in the market. So, just take your pick and recover your coveted messages without breaking sweat!